The city council just scored $10.5 million for affordable housing — and helped fight climate change at the same time. 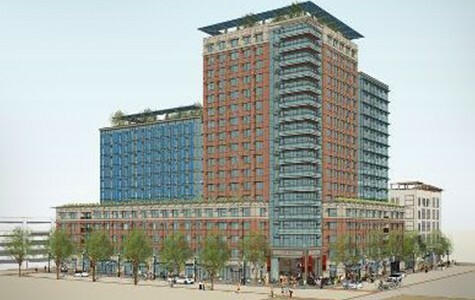 A rendering of the new development at 2211 Harold Way. As the City of Oakland continues to "study" ways to pay for affordable housing, the Berkeley City Council is acting decisively to deal with the current affordability crisis. Last week, the Berkeley council approved a major housing project in downtown in which the developer will pay $10.5 million for affordable housing in the city. The 18-story, 302-unit market-rate project, known by its address, 2211 Harold Way, is also environmentally friendly — it will meet LEED Gold standards — and will generate about $12.5 million in additional community benefits for Berkeley. "I don't think I've heard of a residential project that provided this much in community benefits," said Councilmember Lori Droste, in an interview. It's hard to disagree with that statement, especially when considering the lack of progress that many other East Bay cities, especially Oakland, have made in funding affordable housing over the past few years. According to a Berkeley city report, the $10.5 million paid by the developer of 2211 Harold Way for affordable housing could be leveraged with state and federal grants to build 105 affordable units in the city. And if that were not enough, the developer, HSR Berkeley Investments, also has committed to a project labor agreement to use union workers, will spend millions to refurbish the Shattuck Cinemas' ten-screen movie complex, and will pay $1 million into the city's arts fund. "I think it's really going to be an enormous shot in the arm for downtown," said Councilmember Laurie Capitelli, in an interview. "It's going to renovate all those shops on Shattuck [Avenue]. ... I'm really excited about it." The Berkeley council's forward-thinking decision on Harold Way represents a stark contrast to the absence of concrete action in Oakland. Indeed, while the current debate in Oakland has centered on whether market-rate developers should help fund affordable housing at all, in Berkeley, one of the main arguments concerning Harold Way focused on whether the developer was paying enough. In an interview, Councilmember Jesse Arreguín, who abstained from voting to approve Harold Way, called the development a "good project," but said he believes that the developer should have paid an additional $2.4 million for affordable housing. Arreguín noted that HSR Berkeley Investments benefited from an earlier decision by the council to temporarily discount the city's housing impact fee — which helps fund affordable housing — from $28,000 a unit to $20,000. "I really wanted to see more affordable housing," he said. "This project could do more." Arreguín also argued that the Harold Way developer should have paid more in other community benefits — an assertion echoed by numerous speakers at least week's council meeting, according to Berkeleyside. A rendering of the development at 2211 Harold Way. But Droste noted in an interview that the Harold Way developer ended up paying more in community benefits than an independent consultant hired by the city earlier this year said was economically feasible. In addition, the total amount to be paid by HSR Berkeley Investments was millions more than the developer had wanted (a fact Arreguín acknowledged). "I strongly believe that we got the best deal for Berkeley," Droste said. She's probably right. If the council had forced the developer to pay more — either for affordable housing or community benefits or both — there's a good chance HSR Berkeley Investments would have just walked away from the deal, meaning Berkeley would've gotten nothing. Many of these same anti-growthers also call themselves "environmentalists." But they're not — not by a long shot. That's because dense urban housing, especially smart growth projects like Harold Way, are eco-friendly by definition. True environmentalists have long agreed that one of the best ways to reduce greenhouse gas emissions — and curb suburban sprawl — is to build dense housing projects in urban areas near major mass transit lines so that people won't have to drive long distances. Harold Way will be located right next to the downtown Berkeley BART station. Thankfully, the Berkeley council majority in recent years has staved off the anti-growthers and strongly embraced transit-oriented development. The city also has done a good job discouraging car use and encouraging more people to walk, bike, or take mass transit. 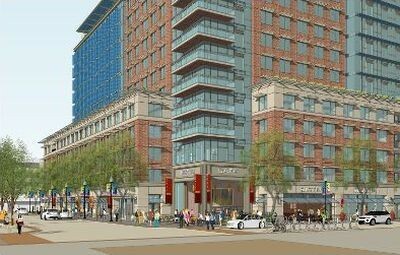 The Harold Way project, for example, will only include 177 parking spots for 302 residential units — far less than the one-to-one ratio required in other cities. In addition, other recent housing projects approved by the city have included very little parking — including two that were recently greenlighted by the zoning board. The City of Berkeley also deserves credit for encouraging student housing, especially considering the fact that UC Berkeley has done essentially nothing to create housing and has been forcing students to pack themselves into homes or commute long distances. The city, in short, is showing how it's done when it comes to housing.